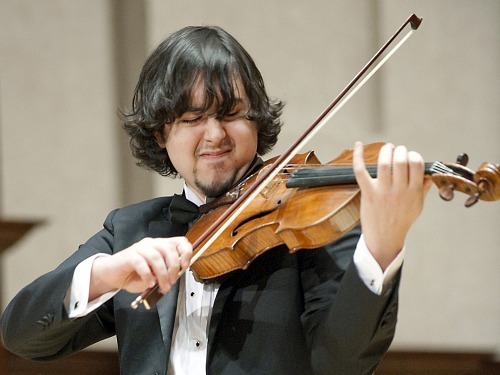 Violist Paul Laraia, 21, has come a long way, from the sink-or-swim public school program where he first picked up the violin to winning the 2011 Sphinx Competition's Senior Division earlier this month in Detroit. Paul is originally from South Jersey and is now in his fourth year at the New England Conservatory. He was one of the few kids in his elementary school with the kind of persistence and natural ability to find a path for himself in music and follow it. Laurie: What made you start playing the viola? Paul: I started on violin, in an elementary school program where everybody gets their own violin and plays along with a CD. As long as you have a good ear, you can just fake whether or not you're reading the music, so I didn't learn how to read music until sixth grade. It was one of those programs that starts with about 300 kids, then by fifth grade, there were three of us left. I was the only one that made it on to our middle school program. Our middle school system has a lot of elementary schools that pour into it, so there were enough violinists for a sixth-grade orchestra. But there were no violists. So my school director, who was a violist herself, convinced me that viola would be the way to get ahead. My little brother, Steve, who is two years younger than me, started played viola. And it's really funny, now we both play viola, and he's a sophomore at NEC, too. I'm a senior. He's kind of been following in my shadows, usually doing a little bit better than how I was doing at his age! And we have a younger sister who is 16, she plays the viola, too. Laurie: A whole family of violists! This lady must have said something really convincing, to make you convert. What was it? It had to be a little bit more than that you would get ahead. I was really interested in getting into this all-South Jersey program in sixth grade, and I'd never had a single private lesson in my life. My mom, being a musical muggle, and I – neither of us knew exactly what it took to get into that orchestra. We just thought, I sound good, so I should be able to get into this. I started taking lessons with high school students – $8 lessons – and started to figure out what it takes in order to get into a program like that. Basically, my teacher convinced me that I would have a much better shot, getting in on viola. Laurie: Did you get in? Paul: The very first year that I wanted to do it, the audition was only a couple of weeks away. I crunched really hard with my first few lessons. My teacher said, 'So you know third position, right?' And I asked, 'What's that?' And then my teacher said, 'Maybe we'll start on vibrato,' and – you can't start vibrato in a week. So I gracefully gave up on that year, with the idea that I would work really hard and try again next year. Then my high school student-teacher recommended me to his teacher, she was Byrnina Socolofsky. She's in her 90s and she's still going strong with a studio of 30 or 40 students, all extremely successful. She was one of the first women conductors of the local university; she's very well-respected in our area. So I studied with her. She was kind of reluctant, though. She knew that I had a good ear, but I didn't play in tune, I never used my fourth finger. Laurie: And how long had you been playing at this point? Laurie: What did you learn from Byrnina? Paul: I learned how to play. I just didn't know how to play before. Through my school program, I'd been left on my own to learn how to hold the bow. They told you to hold the bow like a fox (he holds his right-hand fingers straight, pinching the thumb against the middle fingers) This is how I was holding the bow, and holding the violin like this (slumped) . I was bowing so crooked, and my staccato sounded like 'ck ck' but I thought I was so cool because I could do staccato. (He laughs.) I never liked using fourth finger. It was so awkward and there's an open string for that, why would I ever use fourth finger? So she just taught me everything. She taught me all my fundamentals on shifting and the positions – I went through each position. She taught me the importance of studies and scales – I learned all my scales with her. She taught me my basic love of music, also. She wasn't very opinionated when it came to the way that you would take liberties in a piece, but she definitely knew when you weren't doing enough. She would say, 'Well, don't you want to do more?' She was extremely inspiring, and I'm sure there are hundreds of people you could find around South Jersey who would say the same. Laurie: Did she teach you how to read music, too? Paul: Yes. Obviously I knew, theoretically, how to read music in my first three years. But she had me make these flash cards, and she really forced me to read it like a language. That's priceless. That really influenced my sight-reading skills, and that influences the way you practice and learn music. To this day, I pride myself on being a good sight-reader. A lot of people are afraid to go there, but give me something hard, and I'll try it. Laurie: So you got into that district orchestra the next year? Paul: I got first chair! Paul: When I took the audition, honestly, I didn't even know I was going to get in, I was so nervous. Then the next morning, they put the results up online. I woke up at the crack of dawn. My parents had seen the results first. They came into the room, and they were faking me out. They made this serious face...then they said, 'First chair, maybe!' It really blew me away. Laurie: So did you do a lot of orchestra playing after that? Paul: Yes, I got second chair in All-State that same year, and then the next year I got first chair in All-State. I guess that's how I kept feeding myself, by taking regional orchestra auditions and doing better and better. Then I started branching out and doing chamber music... I started moving into (the) Philadelphia (scene), which opened up a whole new level to me. Laurie: It sounds like he was sort of a role model. Paul: Yes, he was a role model, for a long time. To tell you the truth, that's what turned me on to New England Conservatory (NEC), finding out that he chose to go to NEC and hearing other good things about it. Before that, I lived in this narrow little scope, with the idea that Curtis (Institute) was the only possible way to become a top-level musician. I finally learned that there's more than the reputation of a school. NEC is a true testament to the fact that an inspirational work environment can be just as beneficial for musical training as just being surrounded by other amazing people. Laurie: What do you mean by an inspirational environment, what makes it inspirational? Paul: The faculty, at least all that I've been exposed to, shares a common passion for music. The reason they play at a high level is for the music's sake, not just for the sake of getting a job – or for even for becoming a better instrumentalist. NEC has a huge chamber music focus, and most of the faculty are famous chamber players, with a couple soloists and a couple orchestra players. Paul Katz, Donald Weilerstein and Roger Tapping have all been huge influences on me through my quartet, and I was able to coach with all of them. Also, being able to do Yellow Barn Festival: Being able to work with them more in-depth and play chamber music with them. Of course, I love Curtis, I love Philadelphia and all my teachers after Byrnina were Curtis alumni and members of the Philadelphia Orchestra. I still believe in Rachmaninov's quote, which was something like, "The Philadelphia Orchestra is the sound that I hear, the perfect sound of music." But I'm not stuck on the viewpoint that Curtis was the only way to the top. Music is a lot more than mastering your instrument; it's about the kind of person you are. NEC has been a really great place to absorb that, without even being told. At least for me. Laurie: How did doing the Sphinx last year influence your direction, or did it? This was your second time around, what was that like, the first time around? Paul: The Sphinx is unlike any other competition. I've done a couple of chamber music competitions like Fischoff and TROMP with my string quartets, and obviously this competition has a whole other mission. Even if I hadn't made finals last year or won this year, this would have been an awesome experience. Paul: It's an amazing, friendly, family environment, that's number one. It really took me my time at the competition and my time with the Sphinx chamber orchestra in October to get comfortable and understand that it is like a family here. It feels like all of us friends are getting back together and celebrating. I don't imagine a lot of other competitions are like that. Then on top of it, you have the competition. But once the Thursday competition is over, it becomes really friendly. Actually it starts out friendly, but everybody has to keep their game faces on because you really want to make it. Then once the results are out, there's really no hard feelings. You get immediate feedback from the judges, and you also have masterclasses. It becomes a fully engaging experience, not just a competition. From my understanding, the way most competitions work is that if you lose in the first round, you buy your plane ticket so you can go back home and practice for your recital or whatever that's coming up. Here, you're in for a lot more than just the competition. Laurie: At this competition, when you go back and listen to everybody else, what does that do for you? Paul: There's an element of pride. When I was listening to (other Senior Division competitors performa at) the honors concert today, I was really genuinely happy for all three, because I thought they did a lot of great things. Laurie: What do you feel you learned about your own playing and your own wishes for your own career from the experience? Paul: Last year, I learned a lot from the comment sheets that I received at the end, after the final competition. Even though the judges were different this year, I used those comments and applied them this year, and I think it made a difference. It's nice to have the really broad perspective you get from the judges. You have a 6- to 8-member jury covering every facet that a string player would want: a conductor, a composer, a cello perspective, sometimes bass, violin...And a lot of these people are world-class, super-famous. You know they're coming to something like this for all the right reasons. They're not coming because of the big paycheck. They're coming because they believe in the mission. They're really there to help you. Having a really broad perspective like that is invaluable. Even if you have the best teacher in the world, one teacher can't give you a broad perspective that eight people who are really engaged in the musical world can give you. You never know where you're going to end up in music, especially in this day, so it's really nice to have every angle covered. And when every angle starts zeroing in on a few common themes, you know you've got to work on those! (He laughs.) That's what I worked on, and I think that's what really helped in my first round of this performance. Laurie: Did you learn anything more about what you want to do with music? Paul: I'm just really grateful for the opportunities that I'm going to have. Even if I don't end up being a soloists – how many viola soloists are there? I don't really care where I end up, I'm just going to try to take full advantage of these opportunities. There are going to be some incredible memories, as long as I work hard and prepare my materials, and if more good things come, then I'll be grateful. Laurie: How much did you have to practice for this competition? Paul: This year I wasn't only practicing for the competition, but I also had my grad school auditions, and I just had my senior recital a week or two ago. I just made sure all my repertoire overlapped. In my ideal world, I like to practice six or seven hours a day, and sometimes I accomplish that. Sometimes I accomplish that for many weeks at a time, if I'm devoted to that mindset. My teacher feels that it's pointless to practice more than five hours. Physically, it's just going to hurt you if you practice more than five hours. So five hours is the limit, even though my teacher says, if you take it slow and if you think your body can handle it, you can try to aim for six. You have to spend a large portion of your practice not just sustaining the technical things you know and your security with the instrument, but you are constantly trying to enhance it. That's in addition to trying to learn repertoire. That's why so much time is necessary. When you're preparing for something like this, where preparation is really key, you need a lot of time. But at the same time, when you're on stage and when the nerves kick in and when your world starts crashing on you, the foundation that you laid for yourself in those other hours of practice is what saves you.